The Glenveagh gardens were reclaimed from the wilderness of bog and scrub that account for the rest of this vast Donegal estate. Tamed into submission the formal gardens were initially laid out by wealthy heiress Cornelia Adair who had a keen interest in gardening. Lucy Kingsley Porters who enjoyed a brief tenure at Glenveagh will always be remembered for having introduced the ‘Matt Armour’ single red Dahlia which was bred there by a young gardener of the same name and continues to thrive there till this day. 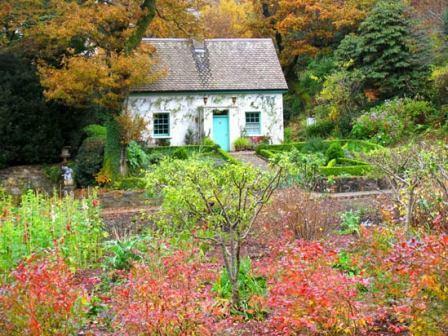 Several notable garden consultants were engaged by successive owners to improve and add to the gardens including James Russell a renowned english nurseryman and Lanning Roper who designed several other gardens around Ireland at the time. Pleasure grounds were introduced and exotic and native tree species were planted including the invasive rhododendron ponticum and bamboo as was the fashion at the time. The formal layout of Victorian vegetable garden with its clipped box and topiary survives today as a showcase in horticultural expertise. A team of seven gardeners maintain the Tuscan garden, rose garden and view garden and tree lined walks in the same style and manner of the original designs. A special tree trail is available to follow and identify the various species. Or for the lazy, one can simply relax with a coffee from the tearooms and marvel at the contrast of beauties between the wild rugged wilderness of the park and the sheltered formality of the gardens. 10 Portsalon play around of golf at the championship links here overlooking Ballymastocker Bay once voted the second most beautiful beach in the world. For more information on Glenveagh Gardens please click here.